Features: Intense action thriller with stunning next-generation graphics and amazing special effects. Play as both a U.S. Marine and British S.A.S. soldier fighting through an unfolding story full of twists and turns. Enter treacherous hotspots around the globe to take on a rogue enemy group threatening the world. Use sophisticated technology, superior firepower, and coordinated land and air strikes on a battlefield where speed, accuracy, and communication are essential to victory. Depth of multiplayer action providing online fans an all-new community of persistence, addictive, and customizable gameplay. 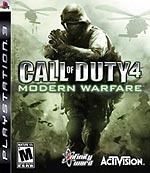 Description: Call of Duty 4: Modern Warfare, the new action thriller from the award-winning team at Infinity Ward, the creators of the Call of Duty series, delivers the most intense and cinematic action experience ever. Verdict: From the moment you turn this game on you are swept into a reality that is all to similiar to what is going on in today's world. The storyline is something you have probably heard before on the news. Out of control regimes in the MidEast and potential anarchy in the old Soviet Union. The two factors make for a very intense game. I don't even know if game is an appropriate title for something so realistic. Your mission is to stop a rogue government from getting their hands on nuclear weapons. Obviously a big challenge for anyone. If you have played previous 'Call of Duty' games you know the quality that goes into the gameplay. Never overly to difficult for a first timer. Much of the combat is very similiar to previous COD games. The objectives are always short enough to keep the player involved. What sets this Call of Duty game apart from it's previous incarnations is the amount of realism that has gone into it. The graphics and sound are so real that you could almost think your watching a movie....Actually more real than a movie. The only thing that may be lacking in this games single player missions is the lack of co-op play and the overall shortness of the game. Most will have it completed under six hours. Of course you can always give it a try and a more difficult setting. The online multiplayer is amazing. To say the least I didn't expect it to be this intense. From the moment you start an online challenge you are thrusted into battle. The game seems to keep the online working in such a way that it seems incredibly realistic. What I also enjoy about the online is that it allows you to rank up rather quickly but you must have enough skill to be an asset on the battlefield. Online there are numerous different missions that keep the game extremely fun and fresh. Although you won't have access to these challenges until you prove your abilities. What also keeps it fresh is the ability to gear your soldier differently as you advance thru the online. This game will definitely have people playing for many, many months. If you enjoy shooter games and most importantly like realistic war sims then this game is for you. The graphics are amazing, the environments almost look too real, and the sound sets this game apart from others that have flooded the field. If you ever wanted to have an idea of many of the challenges that today's soldiers have to deal with then you need 'Call of Duty 4.' This may possibly be the game of the year.